Healthcare for millions of Americans is at stake in the latest Affordable Care Act challenge to reach the U.S. Supreme Court -- and if the Court sides with the challengers, the American Legislative Exchange Council (ALEC) and other Koch-funded groups will have laid the groundwork for the healthcare law's destruction. On November 7, the Court granted review of the case King v. Burwell, which argues that the ACA should be read as prohibiting insurance premium subsidies for low-income citizens in states that refused to set up their own online healthcare exchanges -- which is contrary to the clear intent of the law's drafters and to a reading of the law as a whole. The chief advocate for the interpretation of the ACA advanced by the King plaintiffs is Michael Cannon, a fellow at the Koch-funded Cato Institute. If the lawsuit is successful, it would have the immediate effect of making health insurance unaffordable for more than four million people, and could kill the ACA altogether. Governors and state legislatures in around 26 states -- mostly Republican-led -- refused to set up state-run exchanges in recent years, and instead defaulted to a federally-run program; another eleven states entered into state-federal partnerships. 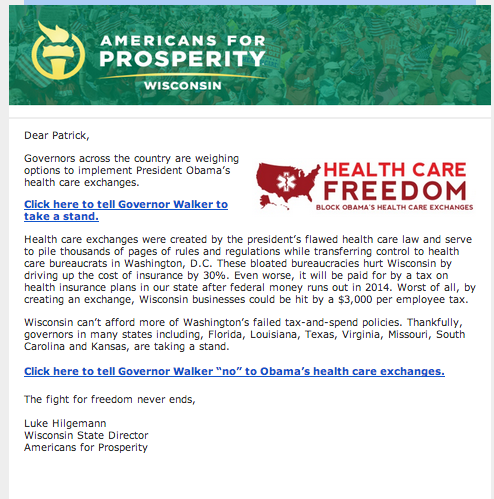 In many states, the decision to opt-out of the exchange was attributable to concerted advocacy by ALEC and the Cato Institute, as well as groups like Americans For Prosperity. If the court sides with the challengers in the King lawsuit, it would strip the citizens of those states of the subsidies they need to afford healthcare premiums, which would deprive many people of the health coverage that keeps them alive. Around 4.7 million people in states with federally-run exchanges have already received insurance subsidies in the form of tax credits, which average around $4,700 per person. "Not only would millions of low-income individuals be unable to afford coverage, the private insurance marketplace would be plunged into chaos," said Wendell Potter, a former health insurance executive who is now an industry critic, and an honorary Senior Fellow on Health Care with the Center for Media and Democracy (publisher of PRwatch.org). "The resulting death spiral would mean that millions of others -- including middle income families -- would find health insurance prohibitively expensive." The impact of a ruling in favor of the King challengers might have been limited had more states set up their own exchanges, as was expected when the ACA was enacted. The insurance subsidies will still be available in the mostly-blue states that are running their own exchanges. Yet, because ALEC and the Cato Institute were successful in urging most Republican-led states to reject the exchanges, a ruling in favor of the King challengers would affect enough people to put the entire ACA at risk. Cannon has not hesitated to celebrate ALEC's partnership in his crusade "to drive a stake through [the ACA's] heart." ALEC representatives and Cannon together testified in opposition to state-run exchanges in states like Idaho, and gave joint presentations to State Policy Network affiliates in states like Illinois. ALEC adopted a resolution in opposition to the exchanges, hosted conference calls with Cannon in 2012 to explain the subsidy theory to members of the Tax & Fiscal Policy Task Force, and along with Cannon participated in anti-exchange events sponsored by Freedomworks, where ALEC's then-Health and Human Services Task Force Director Christie Herrera endorsed Cannon's theory about how subsidies are not available in states that reject the exchanges. The premium subsidies are key to the operation of the healthcare law. The ACA prohibits insurers from denying coverage based on preexisting conditions (and also requires that they satisfy minimum coverage requirements and allow young adults to stay on their parents’ plan). Taken alone, this requirement would drive up premiums, as insurance pools would be populated with people who require more expensive care, and people would wait until they are sick to buy insurance that can't be denied to them. Yet premium costs are controlled by the employer and individual mandates, which help populate the insurance pools and spread costs more widely. The subsidies, in turn, make insurance affordable for the lower-income individuals now required to purchase it. If the U.S. Supreme Court eliminates subsidies in the states that rejected the exchanges -- many at the urging of ALEC and Cato -- it could push the ACA into what has been described as a "death spiral." Fewer people would be able to afford insurance, leading premiums to rise, pushing even more people out of the insurance market, and eventually leading to the collapse of the overall program. Around 8 million people bought private insurance on state- and federally- run exchanges in the first open enrollment period. "The irony is that our system of private health insurance, which Cato and ALEC claim to support, could soon unravel" thanks to their advocacy against the exchanges, Potter says. ALEC, Cato, and AFP are heavily funded by the Kochs, whose network has spent hundreds of millions -- through groups like the Center to Protect Patient Rights, 60 Plus Association, AFP and others -- attacking Democrats who voted in favor of the ACA. The theory behind the King challenge rests on a highly semantic reading of one phrase in the 20,000 page, 381,517 word healthcare law. One provision in the ACA says lower-income individuals qualify for health insurance subsidies when they buy insurance "through an Exchange established by the State." The law's challengers argue that this means the subsidies are unavailable when a state refuses to set up an exchange and defaults to one established by the federal government -- an interpretation that is highly questionable when the law is read in context. The lawmakers and staffers who wrote and approved the law say that Congress clearly understood that subsidies would be offered regardless of whether insurance was purchased through a state or federal exchange. The IRS, which distributes the subsidies through tax credits, has interpreted the law to offer the subsidies regardless of whether an exchange is run by the states or the federal government, and courts will usually defer to agency interpretations. Yet, the Supreme Court went out of its way to take the King case, leading many to fear that the court's right-wing majority is itching to blow a hole in the ACA. There was no split among lower courts that the Supreme Court had to resolve: the Fourth Circuit Court of Appeals rejected the subsidy argument, and the D.C. Circuit Court of Appeals vacated a three-judge panel's ruling against the subsidies to review the case en banc. It takes four justices to grant review -- although those voting records are not made public -- and some have feared that the same four right-wing justices that voted to strike down the ACA in 2012 also voted to take the King challenge, with the hope that Chief Justice John Roberts would (in contrast with 2012) be the fifth vote to eviscerate the law. Even if the Court defers to the IRS' interpretation of the ACA -- that subsidies are available through federally-run exchanges -- it would leave an opening for a future administration to reinterpret the law. Some observers have tried to downplay the potential impact of the King case, even asserting that a successful challenge could strengthen the ACA. If the Supreme Court sides with the King challengers, the argument goes, and declares that insurance subsidies are unavailable in states that refused to set up exchanges, more states will opt-in so lower-income working people can afford insurance. This might be the case in a handful of blue or purple states that defaulted to a federally-run exchange or a state-federal partnership for reasons other than politics, such as Delaware and Oregon. Yet, this argument appears to ignore the role of ALEC, Cato, and other Koch-funded groups in pushing Republican-led states to reject the exchanges with the express goal of blocking the subsidies, and with it, the entire ACA. Cannon's theory about the subsidies was well-established when he and ALEC were on their whirlwind anti-exchange tour. As a result, in many states the decision to reject the exchanges was not driven by a vague opposition to the president or the ACA, but was quite intentionally motivated by a desire to thwart the healthcare law by denying insurance subsidies to lower-income Americans. Although states could set up their own exchanges if the King case succeeds, there is little reason to expect that red states will do so, particularly after last week's elections, which solidified Republican control of state legislatures and elevated ALEC legislators to new leadership positions. And it is questionable whether public pressure would sway many ALEC legislators in Republican-controlled states. Voters didn't hold state elected officials accountable for rejecting the Medicaid expansion that deprived millions of people of healthcare, so it is not clear that voters would hold their leaders accountable for depriving millions more of the subsidies that would make insurance affordable. A proposed model bill on the agenda for ALEC's meeting next month, coupled with the lawsuit, would make the healthcare situation worse for millions of Americans. The "Medicaid Anti-Crowd-Out Act" would prohibit people from enrolling in Medicaid if their employer offers some form of insurance, regardless of how poor the person might be or how much the plan costs. When combined with the King case, this proposal can only be called cruel. If the King lawsuit is successful at the U.S. Supreme Court, then low-income citizens of the 26 states that refused -- many at ALEC's urging -- to set up state-run exchanges would be ineligible for the subsidies that make insurance affordable. And in states that pass the ALEC "Medicaid Anti-Crowd-Out Act," those same low-income Americans -- who cannot afford insurance because the subsidies are unavailable --would be prohibited from enrolling in Medicaid. "It's clear that CATO and ALEC are more interested in imposing their ideology on the American people than doing what is in the country's best interests," Potter said. Thanks be to God for President Obama and the ACA for with out it I would be paying 1700 every month for Insurance via #BCBST. I think the ACA is the law and all the republicans who did not want it to be a law need to get over it b/c it has been in effect for almost a year now and it has done nothing but drive prices down while increasing the number of people with insurance. Interesting Lexicon, confusing Health Care with Health Insurance. Denial of Medical Care by hospitals is illegal in the U.S.. It cannot be based upon ability to pay. Health Insurance, at least as offered in the PP/ACA "Obamacare" legislation, has already closed up hospitals, clinics and reduced the available number of health care professionals while increasing rates for Health Insurance. That's why Mr. Grueber of MIT & the Presidential Advisory Council admitted that this was "A LIE". This article perpetuates that lie. Health Insurance has always been available, just too expensive for some, thus government programs, and Medical Care, once the best in the world and available to all, will now be two tiered: the best for those that can afford private insurance, and rationed for those who work to pay for Obamacrats self indulgences. i am so grateful that someone is exposing these horrible KOCH run organizations! as a native new yorker who now lives in the south, i can't tell you how it feels to be surrounded by so many generally nice people who are quick to call themselves "saved" christians yet continually disgrace our president while opposing the ACA. i am very well off financially and could never understand why someone would oppose those who are less fortunate from having a warm school lunch, an inexpensive health care option or the chance to earn more than $7.25 / hour. please keep up the strong work! someone must oppose these sociopathy zombies.